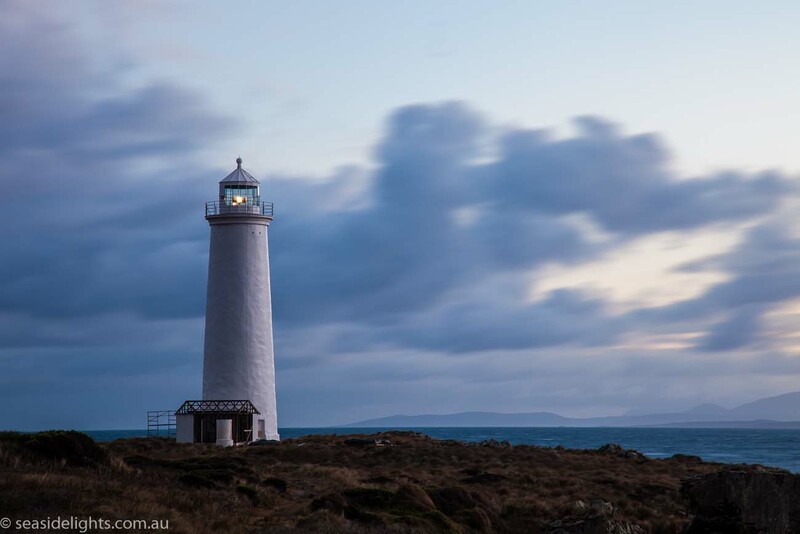 Swan Island Lighthouse | Lighthouses of Australia Inc. The tower was the first established in Bass Strait and is now the oldest tower under Federal control. 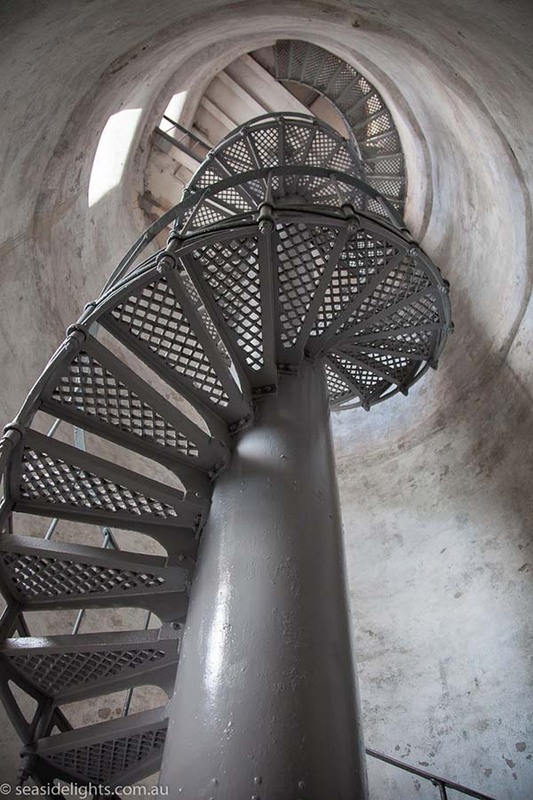 The staircase is unique in that it is suspended off the central column, where all other Tasmanian lighthouse staircases are suspended off the tower wall. Many shipwrecks occurred around the island, the first being the brig ‘Brenda’ in 1832. 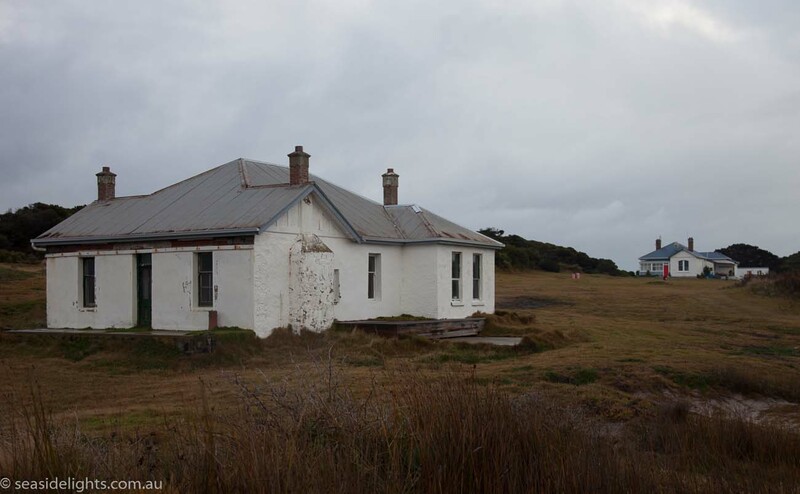 Built in 1845, the light from tower was the first to be established in Bass Strait being completed before that of Goose Island which had been started earlier. 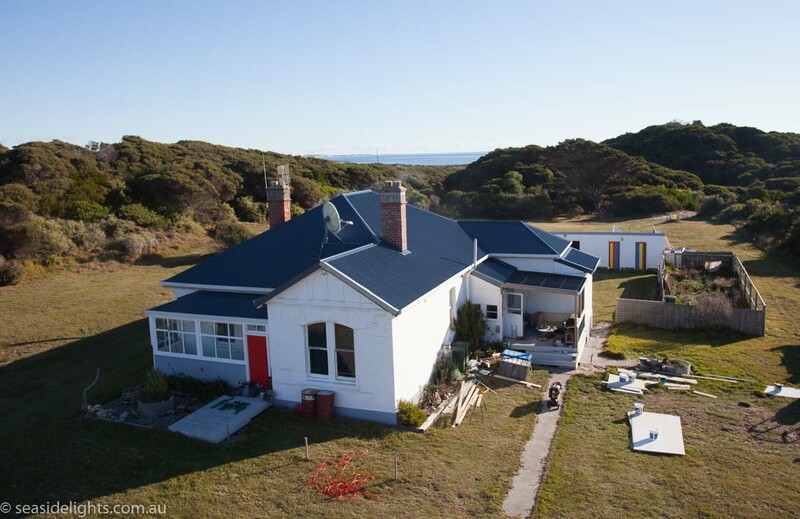 It is now the oldest tower under Federal control, the previous being the oldest being Cape Bruny, though built seven years earlier, has been decommissioned. The lighthouse is a round masonry tower built with convict labour. Originally painted white with a red lantern room, it is now completely white. 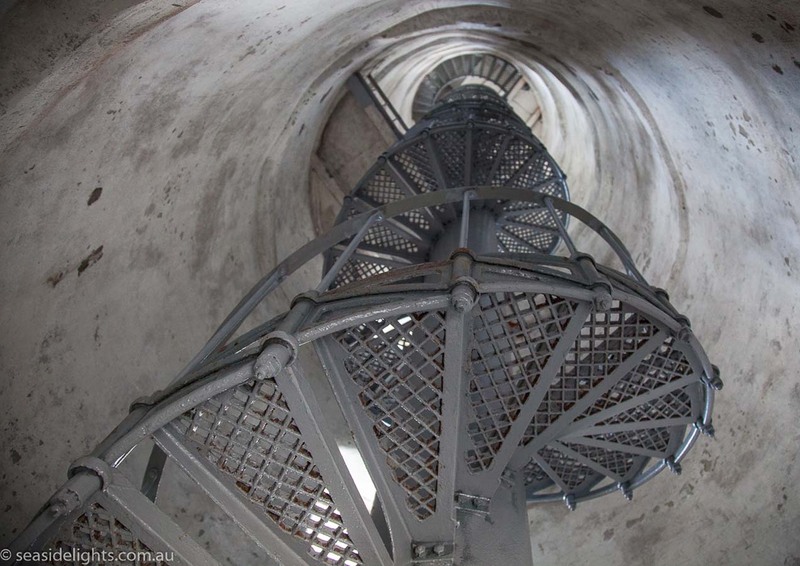 The staircase is unique in that it is suspended off the central column where all other Tasmanian Lighthouse staircases are suspended off the tower wall. The lantern revolves in an anti-clockwise direction, and along with a Victorian light are believe to be only ones in the southern hemisphere to turn this way. The original light source was a new style of single oil wick lamp that consumed a third less oil than its multi-wick predecessors. It was replaced by an incandescent kerosene mantle in 1923. In 1938, the light was converted to electricity supplied by twin diesel generators. Wind generation was experimented with from 1986 till 1990 when the light was finally converted to solar operation. Early living conditions were harsh with buildings being sandblasted by the prevailing winds. Fresh water was scarce and barely fit for drinking. There was inadequate housing for the convict watchmen who often sheltered in the base of the tower. Discipline was difficult as the men resented the solitary life and the Headkeeper had no authority to turn to reprimand the men. At one stage the convicts even hatched an escape plot. Another time they raided a wreck and plundered its provisions. I do myself the honour to report to you as head of the Marine Department, the meritorious conduct of two prisoners of the Crown attached to the Light Station at Swan Island under the Superintendence of Mr Johnson on the melancholy occasion of the wreck of the schooner Mystery then under my command on the 2nd inst. The men in question exerted themselves on perceiving the wreck of the vessel in the most exemplary manner for the preservation of the ship’s cargo, spars and gear although with imminent peril to themselves in which noble conduct they were assisted and cheered on by Mr Johnson to whom in particular I respectfully beg leave to tender my warmest thanks. As however the men to whom I have first alluded are in situations which call for encouragement and reward of a different kind I trust that you will bring their meritorious conduct under the notice of His Excellency the Governor in the hope that he will be pleased to bestow upon them Indulgence! Eventually it was agreed that employing convicts as assistants was unsatisfactory and allowances were raised to attract free men to the positions. The island was connected to the Tasmanian mainland by telegraphic cable in 1886. The cable link was not strong enough to withstand damage from the reefs and seawater and was closed in 1893. With the construction of a new Georgian-style 4-roomed superintendents cottage in 1850, the assistants who had previously been sheltering in the base of the tower were able to shift into the original 1845 house which was also used for stores. The new 1850 house became know as Eliza’s Cottage. A new five-roomed brick cottage was built for the Headkeeper in 1908. At this time additions and alterations were also made to Eliza’s Cottage. In 1927, a fibro assistant’s cottage was built. At this point the 1845 house was abandoned and has since fallen into ruins. The 1927 house was renovated in the 1990s. The island was found to be more infested with snakes than swans with a keeper in 1930 reporting that he killed 1,000 in that year. More recent reports claim that one a day ‘would be about average’. In 1936, radio communication was established with twice daily reports being relayed to Wilsons Promontory. The 1950s saw the delivery of provisions being made by air. The boat shed and the jetty were destroyed by fire in 1982. The light was demanned in 1986 and all the land except that which the light stood on was sold in 1987. The Australian Maritime Safety Authority only owns the light, an out building and the small plot of land it stands on. The island is privately owned. 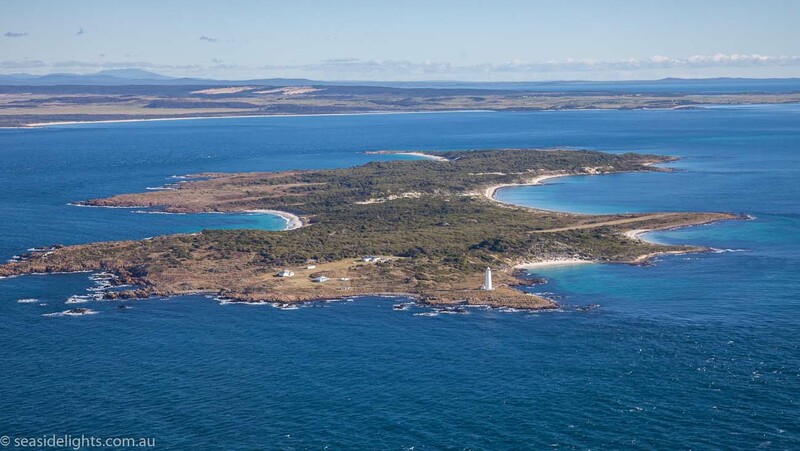 Swan Island is privately owned, so there is no access to the lighthouse. Charles Chaulk Baudinet was the longest serving keeper on Swan Island. He took over as Superintendent in March 1867 and retired 25 years later in 1891. Charles’ wife, Eliza, died of dropsy mortification and is buried in the only marked grave on the island. However, two children who drowned on the island are buried on either side of the grave their wooden crosses having long since disappeared. It is also believe that there are several unmarked graves of Aboriginals forcibly resettled on the the island from the Tasmanian mainland. Andy Gregory, the last keeper left in 1986.